Dimensons: "Paradise Place" 2013, LARGE W = 51.11 x H = 46.61 inches plus 1.5 inch bespoke frame. 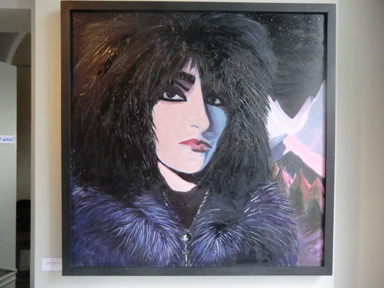 An oil painting of the ice Queen herself Siouxie Sioux, singer with Siouxsie & the Banshees. This painting was selling for £1200 but due to some minor frame damage during transitit will now sell for £900. Register with the mailing list to make sure you don't miss any happenings! !We won't bombard you with info, we'll only send mails when it's something important! !